Motorized forklifts are an essential tool for unloading and loading trucks and otherwise moving heavy inventory. But forklifts—also called powered industrial trucks—can be highly hazardous for a wide range of reasons. National Forklift Safety Day, an observance sponsored by the Industrial Truck Association, took place this week. Cal/OSHA fined a roofing and building supply company $62,320 for multiple serious accident-related safety violations following an investigation of a fatal forklift accident in San Francisco. 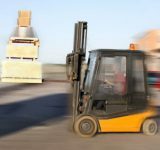 Recently, a subscriber asked the following question: Can we use a work platform connected to a fork truck to lift employees? If yes what are the regulations? Recently, one of our subscribers asked the following question: For pedestrian safety, how wide does a designated protected employee travel path need to be? What type of stationary protective guards are acceptable to prevent forklifts from hitting pedestrians? Do Your Workers Walk Safely Around Forklifts? In July 2014, California’s Division of Occupational Safety and Health (Cal/OSHA) leveled $308,435 in proposed fines against NFI, a warehouse operator in Mira Loma, California. What had NFI done to merit such a stiff penalty? The company had failed to correct conditions at its workplace that put pedestrians and forklifts together in dangerous ways.